I'm as lazy as the next guy when summer hits. So instead of writing anything substantive I'm sharing fun things I've stumbled on from around the web that I think will make you happy. This cute office makeover from Glitter Guide has some pretty pictures. My favorite piece of advice: Display things that inspire you. I found this luggage company on Carly K's blog. She writes about digital tools for a better life, and these suitcases have a built-in scale. Why? So you can see how heavy your bag is before you get to the airport where a stern baggage agent makes you do the unpack-of-shame in front of a judge-y crowd of impatient travelers. Not that that has ever happened to me. Now I'm craving one of these light, modern suitcases in both sizes. I'm thinking white. Do you love it, too? I've told you about Beauty Heroes and its awesome toxic-free beauty subscription service. This month my Beauty Heroes box included the most gorgeous natural makeup. I'm not one of those crazy-for-makeup girls, but this month I fell in L-O-V-E with the "emotive lip gloss" and the rose quartz eye shadow from Modern Minerals. It's light and pretty for summer, with shimmer that doesn't scream glitter. Bonus that the vegan formulation is energetically crafted to sooth your emotions. Yep. Check it out. L-O-V-E. Okay, going out on a limb with this next one. I've been listening to Matt Kahn every morning on my hike with the dogs, and I've never felt better. His modern, practical spiritual message has grabbed me, and I'm better for it. Here's his latest YouTube talk. There's no need to sit down and watch. Just listen. 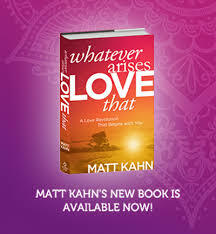 Also reading his book, Whatever Arises, Love That. Finally, The What List is a clever list for curious people. As they say, "lovingly curated by two BFFs on a mission to spark intellect and whet appetites." You'll find something you love in every issue. I'm off to laze around a beach in South Carolina pretending I'm southern for a few weeks. Happy summer to my happy readers!